Following a personal tragedy, business owner Mike Aman found himself evaluating the things that really mattered most to him. Realizing that it was time to spend more time with his family, Generational Capital Markets helped him to sell his business for the optimal price and secure a lasting legacy. Having endured an exhausting commute for 20 years, business owner Mike Polarek seized the opportunity to start living his life without his business. The road to selling his company wasn’t always smooth, but with Generational Capital Markets’s guidance, Mike was able to secure a deal he deserved. When Kathy Zerwas decided the time was right to exit her company, Generational Capital Markets helped her achieve a great result and create a world of opportunities moving forward. Now Kathy is living in the moment and enjoying a fulfilling life beyond her business. When Dave Kerr asked Generational Capital Markets to help him with the partial sale of his consulting business, we found him the perfect partner to grow his company; ready to sell a few years down the line. Bill Bush longed to spend more time with his three grandchildren and get back to his favorite hobby. With the help of Generational Capital Markets’s advisors, we found the right buyer for Bill’s company so he could start doing the things that mattered most. Bobby and his wife Stacy shared a love for the Caribbean. Through the successful sale of Bobby’s software business, Generational Capital Markets was able to help them to achieve the freedom to travel to Belize and beyond whenever they wish. Chris Ludwig's business was his life for many years, but over time his priorities began to change. Generational Capital Markets guided Chris on the optimal time to take his company to market so he could start thinking about his life after business. For business owner Tommy Barker, time used to mean money. As the years passed, he soon realized his time is much more valuable. Having sold his business with Generational Capital Markets, Tommy can now indulge in his passion of restoring vintage muscle cars and do whatever he wants, whenever he likes. The demands of running their business meant owners Bob and Cheryl Finnie never had the freedom to indulge their passions or try something new. Through Generational Capital Markets’s support, they were able to successfully exit their business and reinvigorate their spontaneity. Once their business had grown to a certain level, Michael and Rebecca Baker realized the time was right to take the next step. With Generational Capital Markets’s experienced advisors holding their hand through the exit process, they now have the time to take a breather and reap the rewards of life after business. Having successfully led his company for over 40 years, Jim Gregory wanted to take back time for his other passions. With Generational Capital Markets by his side through the entire exit process, Jim now has time for himself once again. When we help business owners to sell a company, we not only ensure they receive an accurate market valuation and achieve the optimal deal structure, we take them on a journey to re-discover all the things they love doing. Whether that’s spending more time with the family, taking up old hobbies again or working towards personal goals – our M&A advisors help owners realize how much their business is worth and to create the exit strategy that’s right for their future. If you want to take the same satisfying journey as our featured clients, request a private meeting with our M&A professionals. Alternatively, arrange to attend an executive conference or sign up for an in-depth webinar. 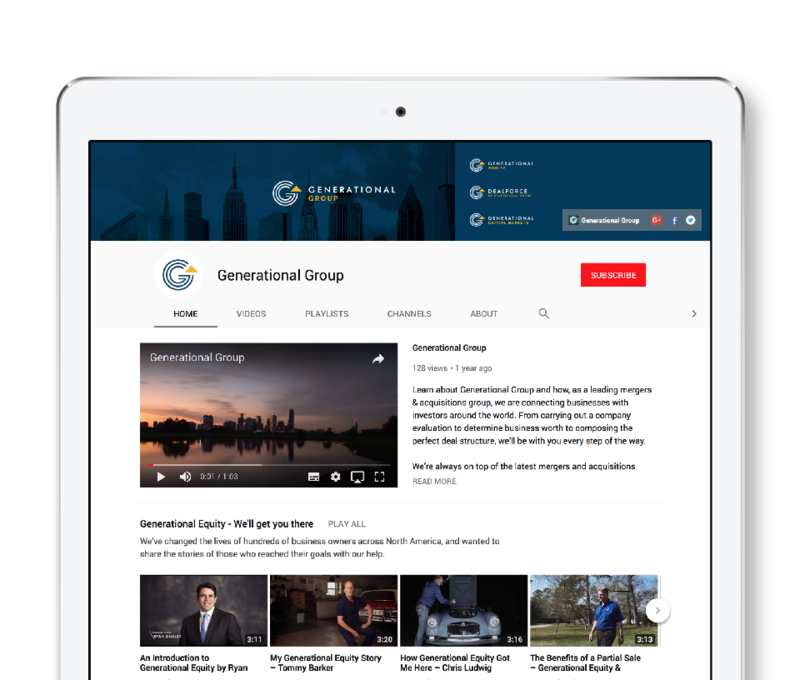 Hear how choosing Generational Capital Markets changed their lives for the better. Every client we work with goes through a comprehensive 16-stage process. This includes a thorough business evaluation, implementing value enhancement methods, full assistance on going to market, negotiation and deal closure. If you are a business owner interested in finding out more about the M&A process, you can learn much more at our complimentary executive conference. Register your place today. Listen to more stories from the business owners we’ve helped, find a playlist of case studies and subscribe to our latest uploads on our YouTube channel.